When we think of anxiety, we tend to think of the shrinking violet stereotype. The quiet kid with darting eyes, biting their nails in the corner, who you know really just wants to go home. 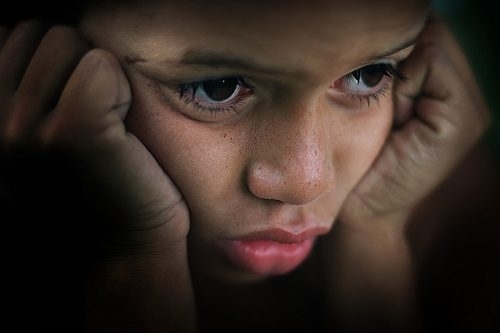 But anxiety in children can manifest in some very surprising ways. Kids don’t have the tools and coping strategies to handle what they are feeling, so they can resort to acting out their fight or flight feelings of panic. Many adults may misinterpret these behaviors as anger issues, defiance, or hyperactivity. Let’s take a look at the hypothetical Johnny. He is a seven-year-old boy in the second grade. Johnny’s grades are not great, and he constantly interrupts the teacher. He does not sit still and wanders the classroom without permission. He lacks confidence in his school work and is resistant to learning new skills. When faced with punishment for his actions, he can be belligerent to the point of screaming at the teacher and attempting to flee school grounds. He ends up in the principal’s office quite often. His teacher believes him to have ADHD and possible anger issues. Upon having him evaluated, his parents come to find that he scores very high on anxiety. Anxiety is essentially an almost-constant state of apprehension. And for some children, that apprehension does manifest in the more expected and typical ways. But for others, it’s constantly activating their fight or flight reflex. So, they fight. Or they flee. Here are some things you can look for to identify possible anxiety in your own children. Do they seem to worry frequently? The worry can be about anything from messing up on their homework to making sure you don’t forget the ice cream you promised yesterday. They may ask for constant reassurance that they are doing a good job, or that you haven’t forgotten about them. They may pitch fits frequently or have frequent headaches and stomachaches. Talk to your child about what they are experiencing. So what can you do if you suspect anxiety in your child? Have them evaluated by a professional. Many of these symptoms can also point to a learning disorder, and the only good way to tell the difference is getting a professional involved. There are several agencies here in Baton Rouge that can assist you with that, such as The Baton Rouge Clinic, Family Services of Greater Baton Rouge, or The Post Trauma Institute. Seeking professional treatment can be key to getting kids feeling happy and healthy again. In the meantime, try practicing mindfulness with your child. When they start to get agitated, ask them what they are feeling, or say “You seem really upset/angry/sad right now.” This can spur on a conversation about identifying their feelings. You can also let them know that you aren’t worried. Since it is your job as their parent is to care for them, you would be worried if there were a problem. You can try breathing exercises, yoga, or progressive relaxation techniques together. There are some awesome free resources on YouTube for kids. Most importantly, remember that there is no shame in seeking help for yourself or your children. We all need a little bit of help sometimes. Indulge in these delicious churros with your family this week. This easy-to-make version requires only crescents, sugar, and butter, but don’t forget to melt some chocolate for dipping. Whether you’re craving it morning, noon, or night, there’s never a bad time for quiche. Feast on this tasty and flaky dish made with eggs, cheese, and bacon. Bring this pasta salad to your next get together. This party-ready recipe is packed full of fresh veggies, cheese, and pepperoni. It’s been almost five years now since I jumped on the fitness train. Six weeks postpartum from a very emotional pregnancy and delivery, I took to walking daily with my newborn daughter in tow. While the EBRP Libraries do not offer Summer Camps, they do still offer a wide variety of fun summer activities for kids of all ages! Check out the Events Calendar. Space is limited for each program. Please call to register. The Brighton School seeks to provide the most effective, evidence-based learning environment in our state for students with Dyslexia and related learning differences. Central Private is committed to preparing students for the future in a safe, nurturing Christian environment in which students are encouraged to grow, share, and learn with a faculty dedicated to academic excellence. 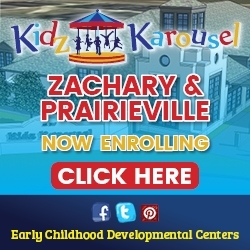 Kid-Possible is a summer day camp in Baton Rouge, La., for boys and girls 6 to 12 years old. With a focus on building enriched experiences for our campers, our camp structure focuses on making each day fun, balanced, and full of excitement!